Nothing sells a book like hype. Even to me. I hang my head in shame in telling you that the reason I picked up this book was because (as I disclosed a few weeks ago) this book was optioned for film by the producer of The Bourne Supremacy. I figured it had to be at least average. But I hang my head no more because this book is stellar. Give it all the hype there is, because it deserves the lot. 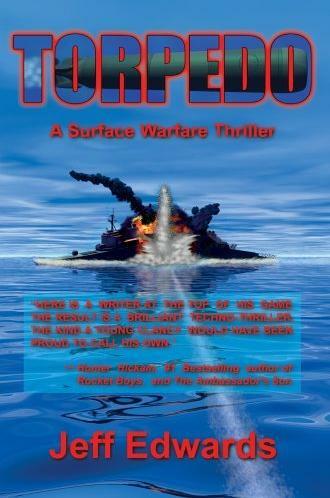 TORPEDO, by Jeff Edwards, tells the story of an international dilemma-turned-disaster(s) that nearly push the United States, the Middle East and the Western European nations into World War III. The only hope of saving the world from the most devastating war imaginable is in the hands of a few men: A handful of Navy destroyers attempt to eliminate a group of rogue submarines--and the enemy is an ally. The story is delicious, a real page-turner (I read it in one sitting) and realistic--an element missing from so many thrillers today. And the authenticity is valid: Jeff Edwards is a retired Navy Chief and Anti-Submarine Warfare Specialist. Unlike Clancy, Edwards probably did not need to research the basis for the story. This man has lived it. Military thrillers have faded over the years (spank me if you want but Tom Clancy peaked at HUNT FOR RED OCTOBER and has slowly defused his writing ever since.) But TORPEDO may just be the novel to bring them back to the top. The pacing is perfect and the story is original and captivating: fighting against an enemy you would not anticipate. The books lists for $19.95 for paperback ($29.95 for hardback) but it is well worth the cash; it's as good as three mass market paperbacks any day. Besides, once Random House snatches it up you'll have an original copy. Don't you wish you had a copy of HUNT FOR RED OCTOBER when it was published by Naval Press?